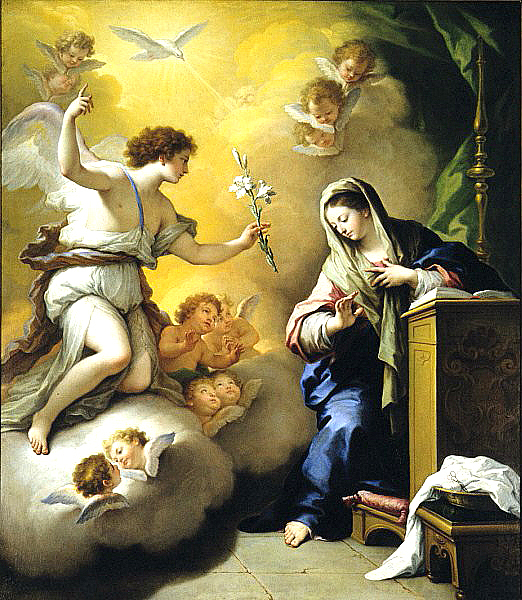 Paolo de Matteis "The Annunciation"
“‘Multitude of Madonnas’ is a series of tableaux that reference classical styles while also accommodating contemporary influences. I am re-constructing the imagery from its’ classical literal form, lending new meaning to the metaphors, symbols, religious iconography, and political content inherent in the late Renaissance paintings. 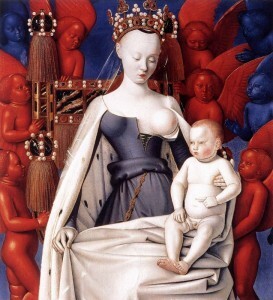 The referenced paintings portray Madonna as a flawless, thin young woman with softly colored, lengthy flowing mane, representing the Renaissance ideal of female value. The supporting cast, whether saints or angels, are all males – typical in Renaissance art as an extension of the rigidly patriarchal social structure and subsequent repression of women. In Renaissance depictions of men maturing through the natural aging process, excluding women from the inevitable phenomena of nature. ‘Multitude of Madonnas’ distorts expectations of age, gender, sexuality, and culture in order to explore contemporary notions of womanhood. I use a different model for each Madonna to accentuate the diversity of women. The images portray my Madonnas as separate characters who are complex, personal human beings, each with their own wants, needs, and desires. The entire assortment of women range from the devout to the sexually mannered, dominated by fleshly, worldly tendencies. I focus on sensuality, mixing contemporary issues into my images in order to represent the vast variety of ways women live today. The resulting compositions poke fun at the passive, demure women depicted in Renaissance art as well as, on a broader scale, a woman’s place in Renaissance society. Rose Barron, "Ma Petite Pomme"
In my image The Annunciation, Madonna is shown reading a fashion magazine, a universal contemporary distraction that establishes the ‘expected’ way women should look. Even Gabriel, the angel, is caught up in the illusions, looking over Madonna’s shoulder at the magazine. This entry was posted in Uncategorized on June 27, 2013 by Whitespace.